It's all about the salsa! Our salsa mix is actually quite revolutionary. It allows you to make restaurant quality salsa in less than 30 seconds. In no time you can have a great salsa with an incredible taste that blows away those jars of salsa you get at the grocery store. 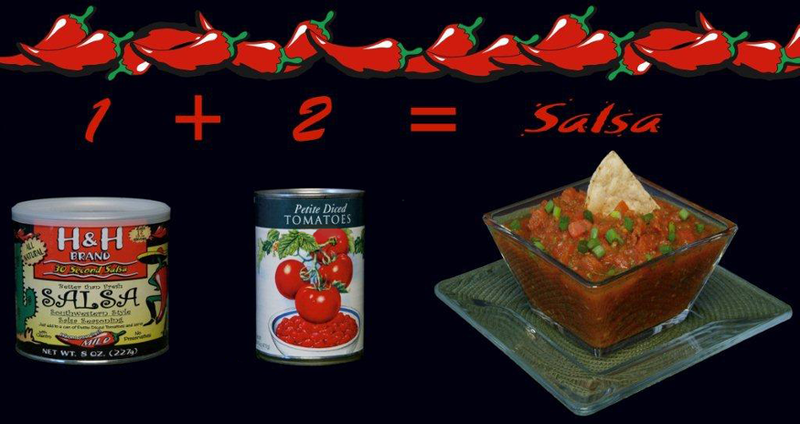 We have mixed a perfect blend of all natural, bacteria free, dehydrated peppers, and spices that you simply add to fresh diced or petite diced canned tomatoes - Then stir and serve. Nothing easier and nothing tastes better! And did we say... IT'S ALL NATURAL! We use the same method, just using modern equipment to do the grinding. H & H Brand Salsa seasoning can be used in a variety of dishes and recipes, such as, dips, meat rubs, soups, sauces, salads, meatloaf, Spanish rice, guacamole, taco seasoning, chili and many, many more.